Since this is the last blog post of 2016, I figured it should end on a happy note. 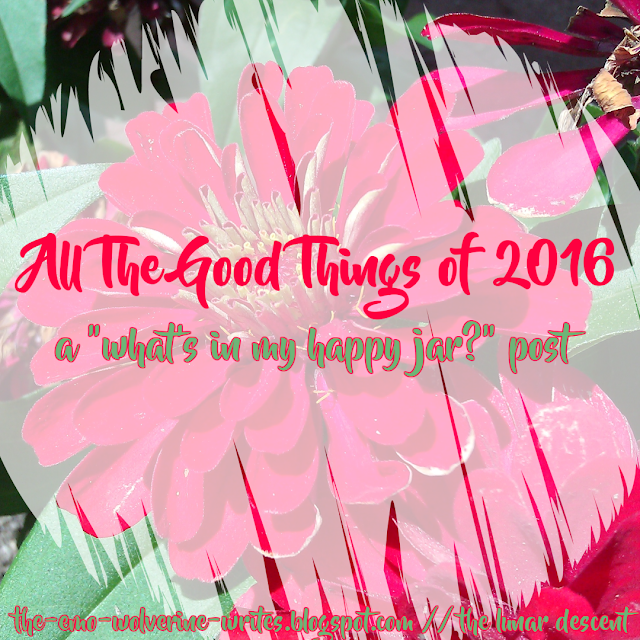 I’ve decided to open up my happy jar and see what I’ve accumulated over the year. I may not have written ALL of the happy things down, but I’ve written a few and I can make do with them. In case you don’t know what a happy jar, it’s basically a jar or a container that you put slips of paper in describing the good thing that happened to you in the day. You fold it up and put it inside the jar. I made myself this little project so that I could open the slips whenever I’d feel depressed, so I would remember all the times I was happy and I’d know that there is so much more to me than the situation I’m feeling helpless in. Thankfully, I have not come across a single occasion in this entire year where I had a depression “phase” as bad as the ones in I had in first year. I never opened up my happy jar before this. In retrospect, there’s something I want to say before you start reading this. I’ve decided to share this post on Facebook. Not because I want point out who ended up in my happy jar, but to mention how these little actions and comments can really make someone’s day. There are some things I’ve written I don’t remember, but there are some things that I can remember the entire scene of. And I will always have a positive outlook on the people who have said something positive to me or have boosted my morale in some sort of way. Always, always say something nice to people. Be spontaneous about it. It’s not hard to end up in someone’s happy jar, the subconscious shelf of memories we have in our limbic system. Anyway. Back to the point. I’m not writing them in chronological order, but in the order that I take them out in. Are you ready? Let’s start. You can draw and knit and crochet! You are talented! I don’t know what prompted this… What a way to open a happy jar. 22nd July. When that lady followed you out of the masjid because she wanted to help the hypoglycemic lady inside and you gave her cookies. Oh I remember this. I remember this. I remember walking out of the masjid with my bag. I remember her asking if I had something sweet for the hypoglycemic lady inside and initially saying “no” to her and then suddenly remembering I had a pack of cookies, and I quickly brought them out and gave it to her. I remember walking back to class with a spring in my step. I remember feeling helpful. 26th Feb. When you showed your notes to Laiba and Dr Bilal asked for your book and said that you should talk to a publisher for these- the notes were useful even for him! I remember this. We were in our Neuroscience module. We had a formative. Laiba must have been in my study group. I remember what page I had out- it was the page with all the cut sections of the brain stem and spinal cord. I remember. I felt very good about my notes, especially since I write them in a way to make even a stranger understand and to be told by a member of a teaching faculty that they were helpful really boosted my self esteem. When you and Amena and Maryam went out to eat gol gappay together and brought chat to eat in Shifa greens! Wasn’t that fun? You had a formative that day! I don’t remember this! But I appreciate how the then me is emphasizing that putting fun before formatives was definitely the way to go! Remember SIST 16 where you met Lalarukh, Samera, Zainab and Mahnoor? Remember how Samera hugged you and was so glad to see you? Because we’re friends. I really do. Have phases in my life when I feel like I don’t have any friends and I wonder if there’s something wrong with me or why no one likes me or talks to me. I know it’s all just me, me and my bad thoughts, and this memory here proves it. I do have friends. I have lots of friends. I love my friends. Of course I remember this. How could I not? 27th Feb. When you and Lalarukh went to Maryam’s house to surprise her but ended up getting surprised yourself. I don’t remember this! But judging from this, I’m guessing the ‘ended up getting surprised yourself’ refers to Maryam’s engagement? I’m not sure, but that’s probably it. (Note for next time; be specific about surprises). Remember that time Zak saw your notes and started shouting about how perfect they were? Like you selected a font on Microsoft Word and printed everything. I remember this. I remember. I remember the session. It was a research session where Dr Sajida divided the class into four groups. I remember that I was sitting in the corner, next to the wall. I remember it was the Endocrinology and Reproduction module. I remember someone taking my notebook for some reason and I remember this guy shouting to the entire class about my notes. Haha. I’ve never seen anyone that enthusiastic about something I’ve done. Remember that time Orooj said she used to read your Instagram posts and she really liked them? I think I remember this. This was after I came back from Kashmir. I had been writing long posts on Instagram on how things were going. I really felt good, knowing that someone was genuinely reading what I was writing and actually liking it. It made me feel like maybe writing these things on Instagram was worth it. It made me want to continue using Instagram as a creative photograph blog. Remember that time you made the PBL presentation and your entire group huddled to see it so you could explain it? You felt so useful. This was kinda dumb actually xD no one in my group wanted to make the presentation so I ended up doing it and then the day of the presentation, I got everything set up and I had already shared the presentation with Laiba who was going to present it. Yes, this is another Neuroscience memory. But then it turned out that the entire group needed to be on stage? Or something like that? So we had a sort of an emergency meeting in the middle of the class where everyone tried reading the presentation on my phone and I explained it as best as I could. I suppose it’s a good memory since it reminds me that I can be useful and I can get some kinds of jobs done for sure. Remember that day when Bakhtawar said that she was glad you were her friend and that if it weren’t for you, she would not have stayed in Shifa? I can’t remember this even though it’s been written pretty clearly, but this makes me feel warm and fuzzy already. Remember when you went to Karachi and Dr Shazia asked about where you went because she missed you and thought you were a smart person! I remember this. Dr Shazia didn’t ask me, specifically. She asked Mehpara where I went and Mehpara told me how Dr Shazia said these things. I remember sitting in Karachi and grinning so hard like ‘Really? She asked about me? She thinks I’m smart?’. I’m not smart. But if someone thinks I am, then I’ll do my very best not to disappoint them. Those are all the chits I have for 2016. One of my resolutions for 2017 will be write more of these because they were genuinely enjoyable to read and remembering them really did make me feel better about myself. How would you sum up your 2016?